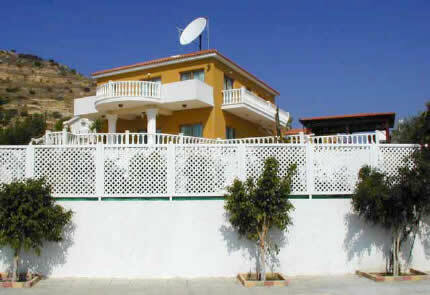 Villa Thea is situated in a quiet development on the side of a hill above the village of Oroklini, with spectacular, uninterrupted, panoramic views of Larnaca Bay, from the village of Kiti in the West, through the Larnaca seafront & harbour, and the beachfront hotels, to the UK services base at Dhekelia and beyond. The mountain of Oroklini is behind & to one side of the property. The beach and large hotels/restaurants are 3km away through the village. Oroklini village has (within walking distance) small supermarkets, butchers etc., an entertainment night-spot, 3 restaurants, 2 take-aways/coffee shops, hairdressers, doctor and dentist, pharmacy, bank, school, builders, plumbers, electricians, local football ground. 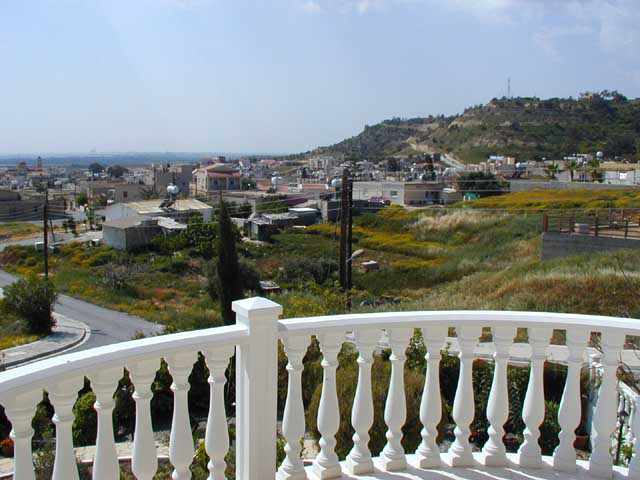 Larnaca town & the international airport are 8km away (the airport is 15 minutes by car). 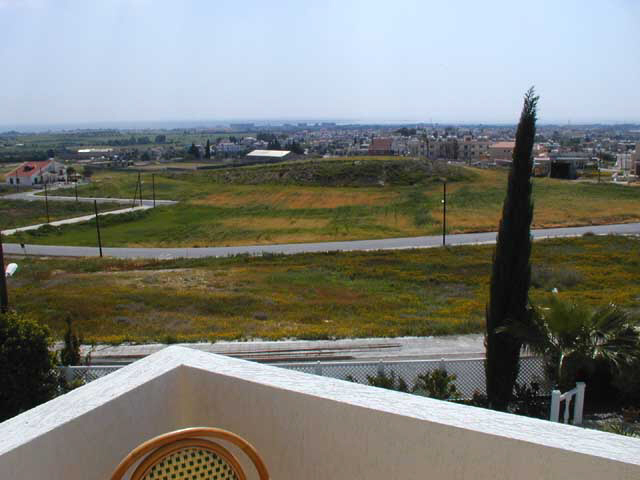 The capital, Nicosia, is 30 minutes away along the motorway. Villa Thea is situated in the middle of a 1,090 sq.meter plot, facing South, with walled gardens along the perimeter and garden lighting. The gardens are watered automatically, and consist of large trees, shrubs, flowers - too many to describe here. 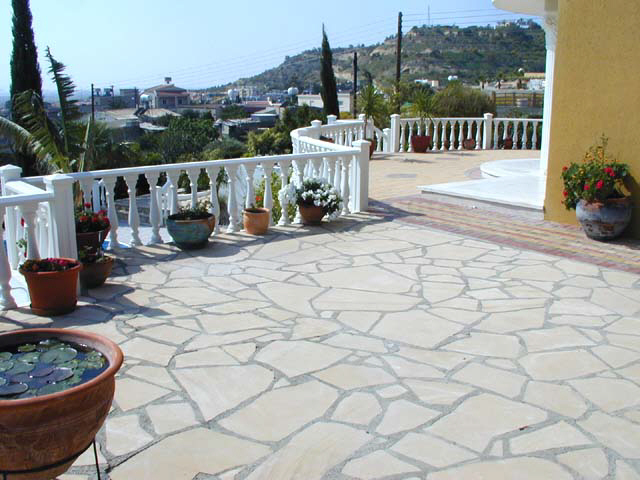 The villa is 250 sq.m., in area with another 50 sq.m.of upstairs veranda's, and on the ground floor, extensive natural stone & ornamental brick paved areas around the house. 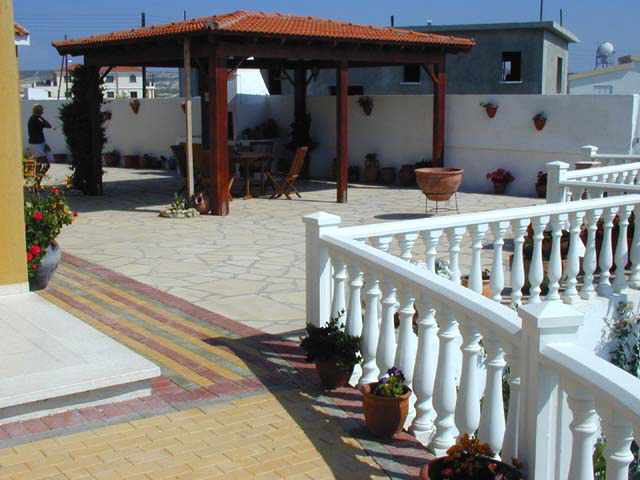 There is a 16 sq.m., tiled, pine-wood pergola for shade over the paved area, near to a large BBQ with sink/water & storage underneath. 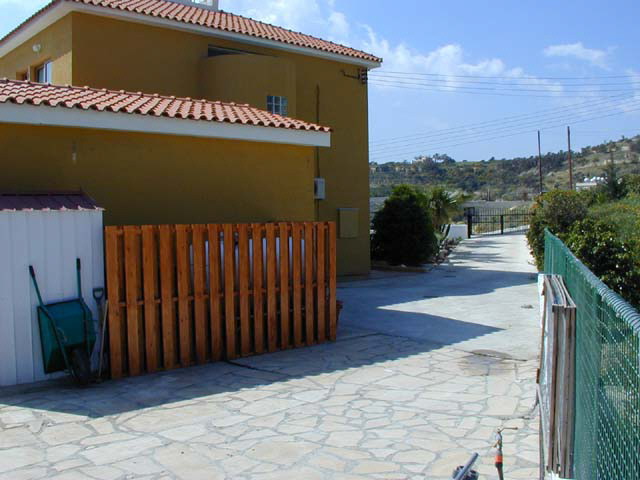 A 6m x 4m garage is situated behind the villa, with a separate gate & concrete drive. It has mains water & electricity, land line telephone & septic tank. 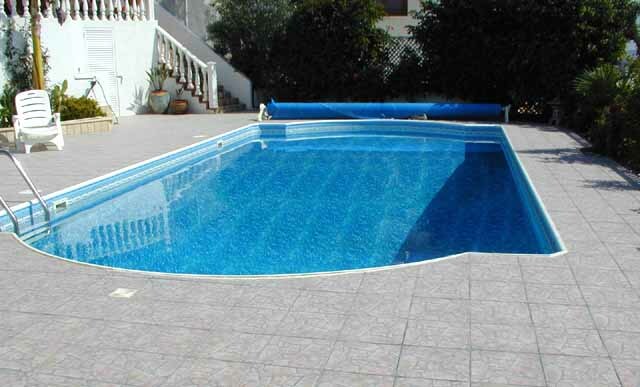 On the lower area, the swimming pool is 10m x 5m with Roman ends, with a ceramic tiled, sun-lounging area surrounding it, with a shower, and peripheral flower beds. There is a separate room for the U.S.-made Jacuzzi pool-pump, filter, & machinery, pool-covers and heater-boiler & oil deposit & other storage. The pool is heated by kerosene for the winter months. 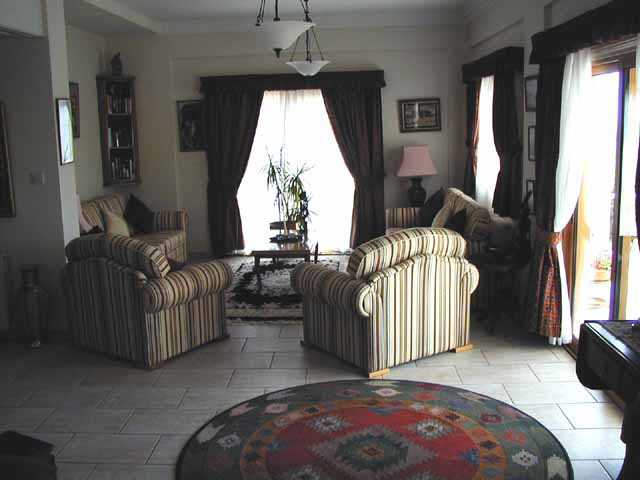 On the ground floor, the villa is accessed from the front gate & walk, through large, double solid oak doors, and has an open plan, fully floor-tiled lounge, TV area, dining room, telephone points & electrical outlets, fitted corner bookcases and showcases, air conditioning / central heating. the lounge leads down to a guest toilet & hand basin with a small storage room under the stairs; and through double, glazed doors to the kitchen (6m x 3m): fully fitted with dishwasher, washing machine, oven, hotplate & extractor fan, full-size fridge, double sink, above & below and full-sized cupboards with wooden doors, a wine rack; the room is half-tiled. The exterior kitchen door gives access to the garage side door under cover. The first floor is reached via a pine-railed, fitted carpet staircase. 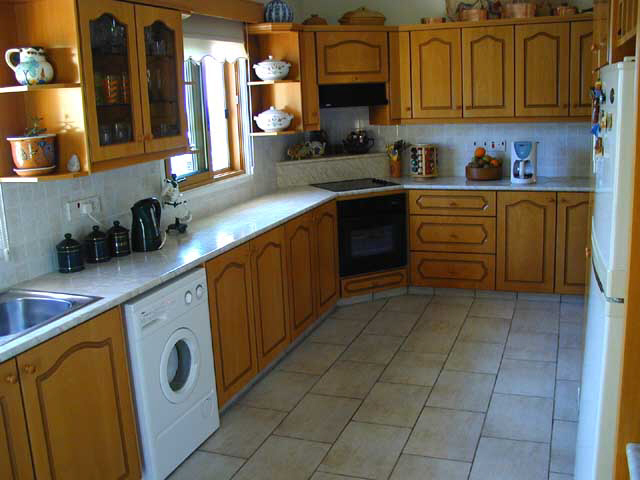 All areas upstairs are with fitted carpets, with the central landing area having a separate single-sink, fridge & storage area, closed with double wooden doors, and a storage cupboard. This central landing area leads to the three bedrooms and separate bathroom (2.50m x 3.10m), fully tiled, which has two mirrored hand basins, bath/shower & toilet with fitted storage. 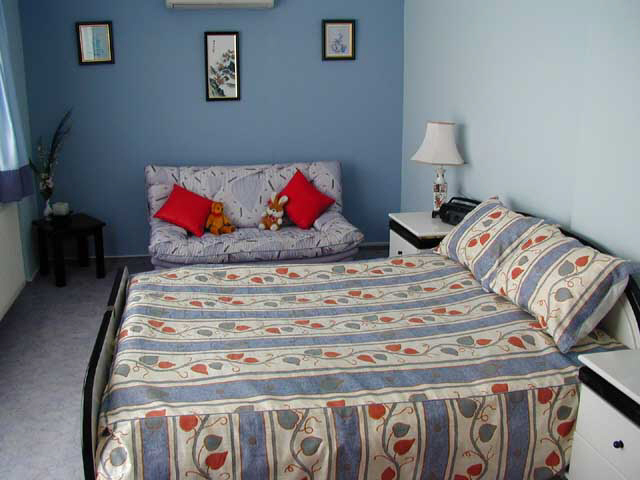 The first bedroom (4m x 3m) has a double bed, fitted wardrobes, mirrored vanity unit, electrical outlets, air conditioning /central heating. and windows leading to the veranda overlooking the patio/pool , some of the bay & plains. 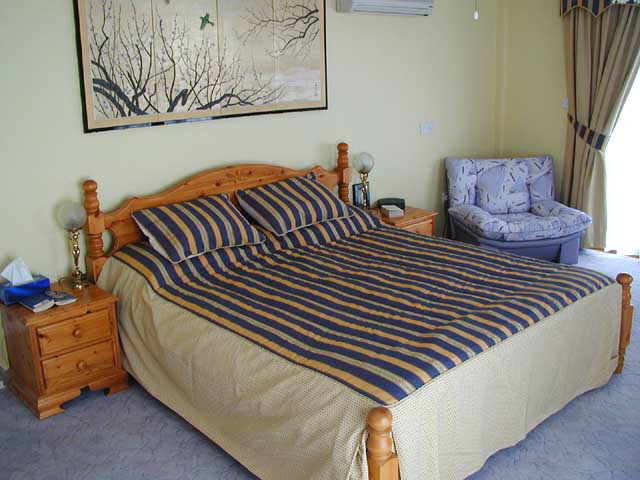 The second bedroom (6m x 3m) has a double bed, fitted wardrobes, mirrored vanity unit, electrical outlets, air conditioning/central heating and windows leading to the separate veranda overlooking the front garden & the mountain behind. The master bedroom (4m x 5.60m) has an en-suite bathroom (2.80m x 2.40m), fully tiled with a mirrored hand basin, bath/shower & toilet with fitted storage. This bedroom has T.V. 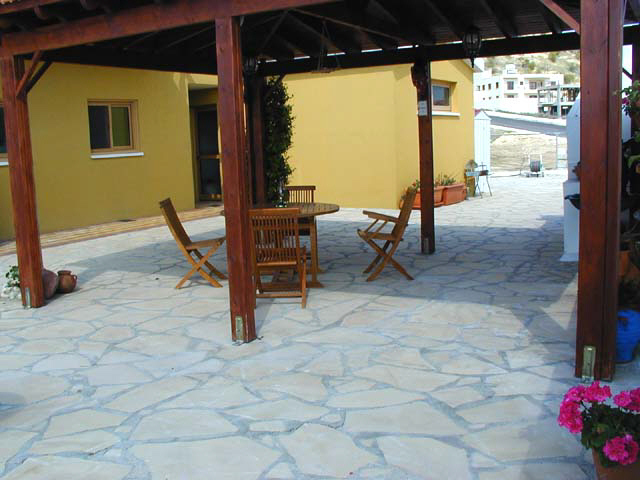 telephone & electrical points, air conditioning/central heating and patio windows leading to the side veranda and a patio window leading to a separate veranda, with panoramic views over the garden, pool, village & Larnaca bay. 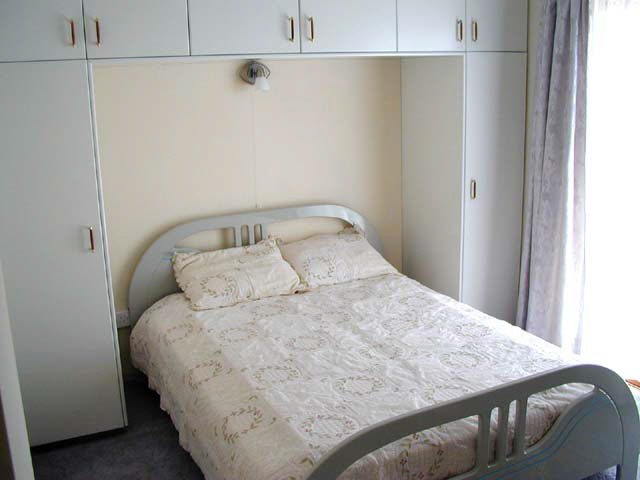 It also has a connects to a separate dressing room (2.80m x 2m) with fitted wardrobes. There is access to ample loft storage space above the central landing area, and an access to the, solar-heaters, TV antennas recessed in the roof. There is a large, stone paved area behind the garage with the house boiler, water pump, kerosene & water stores. this has plans for extension of the garage above for 2 extra, separate, bedrooms with a separate toilet, shower & hand basin, should you wish to have these extra amenities. Copyright © 2000-2019 Armata. All rights reserved.